The growth of smart cities is forcing governments to think the need to advance in the implementation of information and communication technologies (ICTs) for the improvement of the citizenry’s participation in decision-making processes, the increasing efficiency of public services, and the improvement of transparency and accountability. In this regard, governments in smart cities are called to play a key role in promoting and managing these cities. 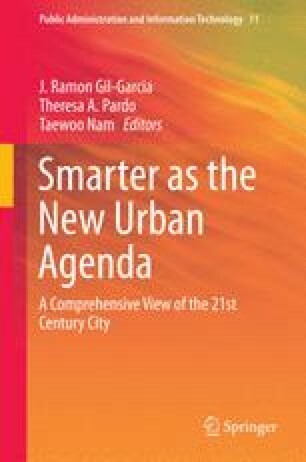 Based on prior research, this chapter seeks to analyze the role of governments in smart cities, trying to identify different patterns of management styles in these cities. Also, differences between theoretical and empirical studies about the role of governments in smart cities are identified proposing new research themes for the future. This research was carried out with financial support from the Regional Government of Andalusia (Spain), Department of Innovation, Science and Enterprise (Research project number P11-SEJ-7700). Fazekas, M., & Burns, T. (2012). Exploring the complex interaction between governance and knowledge in education. OECD Education Working Papers, No. 67. OECD Publishing. http://dx.doi.org/10.1787/5k9flcx2l340-en. Giffinger, R., Fertner, C., Kramar, H., Meijers, E., & Pichler-Milanović, N. (2007). Smart cities: Ranking of European medium-sized cities. Vienna. http://www.smart-cities.eu/download/smart_cities_final_report.pdf. King, N. (2014). Template analysis [www page]. School of Human and Health Sciences, University of Huddersfield Web. http://hhs.hud.ac.uk/w2/research/template_analysis/. Accessed 9 March 2014. Lee, J. H., Hancockb, M. G., & Hu, M.-G. (2013). Towards an effective framework for building smart cities: Lessons from Seoul and San Francisco. Technological Forecasting and Social Change. In press, corrected proof. http://www.sciencedirect.com/science/article/pii/S0040162513002187. Accessed Jan 2014. Nam, T., & Pardo, T. A. (2011). Smart city as urban innovation: Focusing on management, policy, and context. Proceedings of the 5th international conference on theory and practice of electronic governance, Tallinn, Estonia, 26–28 September 2011. http://dl.acm.org/citation.cfm?id=2072100.